This is the best no-bake cheesecake you will ever make because it takes almost no time at all and tastes delicious. Instead of getting frustrated in the kitchen you can focus your efforts on something else rather than dessert. Easy desserts are not hard to come by these days as you can surf the web and find just about anything your tummy or mind desires. The minute someone who doesn’t fancy baking reads how to make a cheesecake they turn the page because they think it’s too difficult. I’ll say that cheesecake is a delicate recipe if you make it the traditional way but the no-bake cheesecake is really a no-fail recipe. If you aren’t someone who enjoys baking and want to whip something up in a flash no-bake recipes are the way to go. It’s also great if you don’t have an oven where you live but still have a sweet tooth you want to satisfy. Unlike Mr.CBB’s Cherry Cheesecake and Blueberry Ricotta Cheesecake recipes you will find this one different because for one you aren’t baking it and I don’t use a traditional graham cracker crust. For those of you that don’t have graham crackers available where you live this is a great alternative for a no-bake cheesecake base. Sometimes you get bored with making the same type of cake recipes which can be heavy after a lunch or a dinner. I have been busy in the kitchen doing my whirlwind impressions baking and cooking for what seems like thousands but it’s really just the five of us. This week I’ve made Granola bars and Oatmeal Jam Squares, mini banana loaves and a few other desserts for the week. Let’s not forget the main meals in-between all of this, but I enjoy it. The other evening for dinner I made some lovely garlic and cheese polenta squares which will be coming soon to the blog as we wanted something light to go with our pan-fried Tilapia fish. My eldest had a tournament this weekend so I didn’t want him eating anything too heavy beforehand and fish is a perfect light meal. In the end though I had to give in and make a treat as they have bugged me to make my lemon meringue pie for weeks now. Instead I made my Lemon No-Bake Cheesecake topped with some homemade rhubarb and strawberry jam that I also made this week. No one likes to spend hours in the kitchen over the hot summer months baking even if you have central air-conditioning so the n0-bake cheesecake was perfect. Essentially you can create any type of no-bake cheesecake from this recipe and top it with whichever flavour you fancy. The lemon just gives the cheesecake a bit of pizzazz or you can leave it out if you want it to be a plain cheesecake. The lemons were on sale so I managed to get a big bag for $2.24 half price which is a big savings. With the rest of the lemons I will make my Homemade Lemonade for the kid’s and either slushies or freezies which are great to have on hand for these hot summer days. 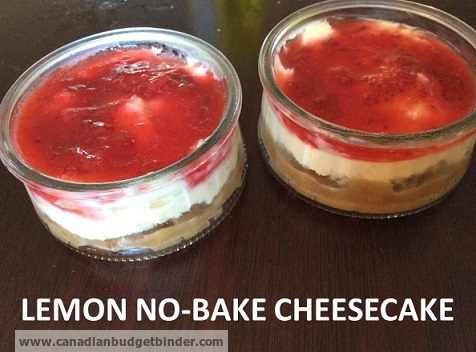 What is your favourite no-bake cheesecake? Cook time: 5 minutes for the base. Refrigeration time: Until cool but you can eat it right away. If you don't fancy turning on the oven during the summer months or are in a pinch for time try this lemon no-bake cheesecake recipe which is perfect for an afternoon treat or after meal dessert. Mix the base ingredients together in a bowl, flour, brown sugar and butter. Now place in a pan and stir until it comes together for about 5 minutes. Once it has come together scoop into base of 8" round dish or mini dishes and press down so that there is a thin crust at the bottom. Mix together the rest of the ingredients in the bowl until it starts to become fluffy and thick. Take the dish/dishes out and spoon mixture over the top of the crust and smooth off the top. Place in the fridge until ready to serve as you can eat it straight away. There you have it a quick and easy dessert for any cheesecake lover! For extra indulgence why not place one of your favourite homemade cookies at the bottom then the cheesecake or even sprinkle with chocolate shavings on top. Mmm! This recipe really looks yummy! This Sunday is my cousin’s birthday, I should try this one. Guys let me know how it turns out and especially with the gluten free we’d love to hear about it! This. Sounds. Amazing. I’m actually going to print this off. I love lemon and my wife loves cheesecake, so hopefully we can agree on this one. Plus, nothing like avoiding a hot oven during summer! I’m really excited to give this a try with our gluten-free flour and see how the taste comes together! I love the fact that it’s “no bake”, that already made this my favorite recipe and I haven’t tried it yet! This dessert is a must especially in these hot humid days for a no oven cook night lol! Cathy it’s one of those desserts that can be made to suit especially for those of us with that sweet tooth lol! No bake!!! Right up my alley as we don’t have that lovely central air!!! Thanks Nicola!!!! !